Swing your partner. Do-Si-Do! Books about square dancing are a little harder to find than one might think! But I did manage to scrounge up two I think you’ll enjoy. Mr. and Mrs. 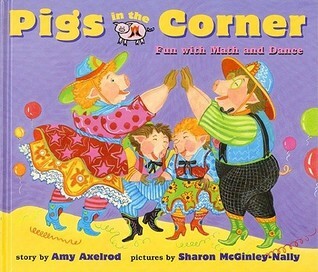 Pig and the piglets are excited about the Square Dance Recital because Grandma and Grandpa Pig were coming to watch them dance. But then they find out the their teacher has come down with a cold and there’s no one to call the dance. Mr. Pig offered to help out. But as soon as the dance begins, Mr. Pig loses his glasses and he can’t see where the dancer are on the floor. The result is a pile of dancers on the floor. But everyone was laughing and seemed to have a good time regardless. 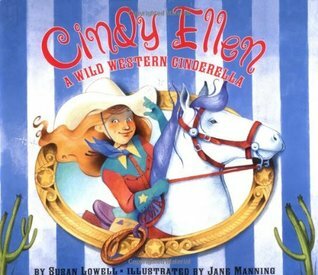 Cindy Ellen’s daddy married the orneriest woman in the west. She and her two awful daughters turned Cindy Ellen into their own personal work horse. One day the biggest cattle rancher in the area invited all his neighbors to a ‘wild and wooly rodeo’ and then a square dance. Cindy Ellen helped her stepsisters get ready and then was left behind. Cindy Ellen’s fairy godmother showed up with a bang-bang of her pistols. Her pistol covered Cindy Ellen with fairy dust turning her rags into the finest riding clothes ever seen west of the East. She wore a creamy white Stetson and cowboy boots with diamond studded spurs. The first night, Cindy Ellen roped and galloped her way into Joe Prince, the rancher’s son’s heart. The second night, Cindy Ellen’s fairy godmother turned mice and a horned toad into a coach pulled by six dappled horses. Then with another blast from her pistol, she turned Cindy Ellen’s rags into a dress that shone and jewels that sparkled. Cindy Ellen danced all night with Joe Prince while the fiddlers played and the caller gave dancing directions late into the night. When she heard the clock stick twelve, Cindy Ellen bolted away from Joe Prince leaving only one diamond spur behind. Joe Prince searched high and low for the woman whose boot fit the diamond spur. When he put the spur on Cindy Ellen’s dirty little boot, it fit perfectly. And when Cindy Ellen buckled the other spur to the other boot, her fairy godmother appeared firing her golden pistol in the air. Sparks of fairy dust settled everywhere, turning Cindy Ellen’s clothes from cotton to silk. So Cindy Ellen and Joe Prince got hitched and lived happily ever after.